In line with the ongoing question of political art, I am currently working on a project of “artistic research”, in collaboration with Norwegian artist Jeannette Christensen. I have followed Jeannette’s work with passionate interest since I fist saw it, in the 1990s, and written extensively about it. The last writing became a book Fragments of Matter with a rich array of photographs of Jeannette’s art. For more on the art-side of this project, see the page Film Projects. The main protagonist of this essay is time: time interrupted, disturbed, and thereby made experiential; and time interrupting, in positive and negative ways, leading to critical and felicitous situations. Life is defined by time passing. As one philosopher wittily summed it up: “time is there all the time”. (Gjesdal 2017) I hope to consider a few experiments with time robbed of its self-evidence; of that simply being there all the time. Both Christensen and I probe the question what happens when that happens. Time is made visible, perceivable, sensible, by changes in pace, stagnation, but also by being interrupted. My current research continues another line of interest I have had ever since working on the moving image in relation to migration, which had resulted, in 2007-08, in a traveling exhibition I co-curated with Spanish art historian and curator Miguel Ángel Hernández-Navarro, as described here: 2Move Working with Miguel was a genuinely dialogic process that helped us both to new insights. The question of temporality became quite central in the subsequent work of both of us. Through temporal work, it is already an image that interrupts the enduring silence, the timelessness of Johannes Vermeer’s masterpiece. We consider Vermeer’s paintings silent, indeed. This is part of why and how images are still. But making a snapshot of such a work is probing the question of what that means – still? Vermeer’s art can even be seen as the embodiment of stillness – harbouring the silence of images we call “still” in the double sense of (auditory) silent and (physically) unmoving. This double meaning contains a double paradox. 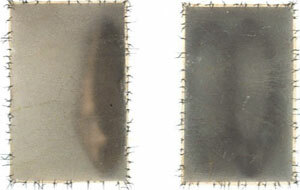 For, firstly, still images do move, in the emotional sense, and more so due to their stillness. This is the (Adornian) autonomy side of art. And secondly, on the level of the depicted scene, the interruption of the music-making silences the depicted woman, thereby drawing attention to her earlier and later sound-making in the fiction depicted. This makes interruption a motor of narrativity: because of the implied suddenness of the interruption, the times of before and after accede to the stage. The interruption also foregrounds the art work’s sociality; it shows that it intervenes in the silenced movement of life. Christensen’s series of polaroids shocks us into thought (Massumi) about time, silence and stillness by their live models. This is what the concept of “artistic research” enables us to see. But still, these snapshots are still – differently. The woman is partly in her own time, but with the full complexity of its baroque conception of time; and also in a time that she shares with ours. In-between, the time of modernism has passed, of which Jonathan Crary (1999) has illuminated the interruptive quality. The videos that are in production are exceedingly slow. This is Christensen’s way of challenging not only the current culture of speed, but also of foregrounding in innovative ways the relationality of art. The interruption, which is the core of her project, is related to trauma, as I intend to argue in my study of this work. The other wing of this project is a study, elaborated also in a video project, of another baroque artwork, Miguel de Cervantes’ Don Quixote. Here, the frantic pursuit of activity is almost a persecution by time. This temporality is also generated by trauma, but with an opposite rhythm. Here, hecticity is the motor of the narrative. This temporality is closer to Cervantes’s. The Spanish author explored the temporality also from within a baroque sensibility. The hecticity in the behaviour of his quintessentially traumatized main character is a counterpoint of Vermeer’s young woman, who shares with him a sense of the unlivable nature of time. We can even claim that among other artists Vermeer, through his aesthetic that so powerfully interrupts our routine of perceiving stillness in the still image, may well have intuitively called for the invention of cinema, which occurred so much later – or rather, that this invention was long-awaited. This is another way in which painting explodes its own limits and speaks to philosophy and technology. And if, on the other hand, Cervantes’ novel is notoriously impossible to turn into a film, the two artworks share the ground of traumatic temporality. The poetics of Cervantes’s novel consists of sprinkling events in which times are collapsed; in which, for more temporal confusion, “formerly is today” (Davoine 2008). As was to be expected, this project includes a conception of time that does not obey chronology with its linearity and its assumed evolutionism, which suggests that things get better while clearly, they get worse. El Ingenioso Hidalgo Don Quixote de la Mancha (part I 1605; part II 1615) stands out in its intensity. It presents a creative expression of prolonged and reiterated hopelessness. Formerly, Davoine suggests, in deep history, things happened that still happen, or happen again, today. Like spectres, they cast their shadow over the present – that time frame that is ours when we see images (Peeren 2014). In the wake of its author, the severely traumatized main character demonstrates, for the benefit of us all and through yet another paradox, that time is both constantly halted and hectically continuing; disempowering the traumatized subject who, deprived of the routine of life, is unable to keep a grip on living-in-time. Cervantes was a slave in Algiers for five years without knowing if he would ever get out. For the first time in my work, the similarity between author and character seems to make sense – the historical facts of the author’s life turn him into a companion for the character, who is so in dire need of companionship. Everything that happens, interrupting routine, makes an event. Reading is Don Quixote’s primary transgression, or defect – the counterpart of Vermeer’s woman’s music making. She, too, was reading, as the sheet of music in her hands intimates. Even the quietest – stillest – scene, of reading, shows a string of interruptions. In short, the project, new in the sense that it is developed as “artistic research”, continues my search for an academically as well as artistically effective experimentation with video images, through what I have called “theoretical fictions”. Still at the beginning stages, I hope to be able to report on the long-term project as it goes along. On the side I keep getting requests for catalogue essays and artist-book texts, lectures and advising tasks, which, as I have experienced, will nourish the in-depth research rather than distract from it. 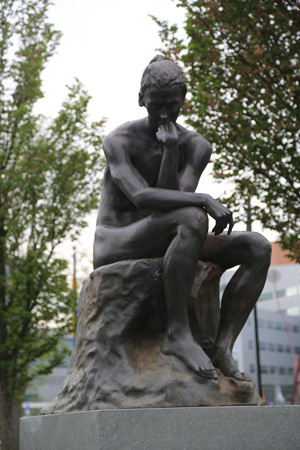 The latest, for example, a text for a publication on a sculpture installed in The Hague in front of the EuroJust Building by Spanish artist Fernando Sánchez Castillo, called Penseuse. This is a remake of Rodin’s famous Penseur, with the gender reversal as an entrance but by no means the only intervention. to catalogue texts for Nalini Malani’s two-wing retrospective exhibition, one last Winter at the Centre Georges Pompidou in Paris, this other the coming Fall in Castello de Rivoli in Italy. 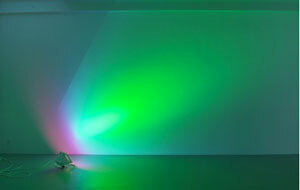 I will soon visit a large exhibition of Eija-Liisa Ahtila’s recent work in Museum M in Leuven. My interest in movement has led to a participation in a group exhibition at the Frans Hals Museum in Haarlem, where I was invited to explore the very small portrait of René Descartes. This led to a double installation in the two parts of the museum, based on sections from Reasonable Doubt supplemented with other relevant material, and an essay on portraiture, focusing on movement. 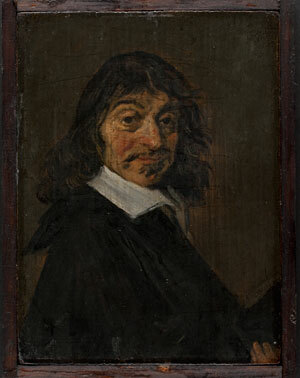 I argue that both the doubt about the authenticity of this tiny painting, and even the tradition view of Descartes with drooping eyelids are wrong. Instead, the philosopher is disturbed by the need to turn his face towards the painter, the movement of which is caught in the hair on our right and other details. I aim to continue this examination of portraiture in the Aesthetic of Interruption, in other words, the Don Quixote project. 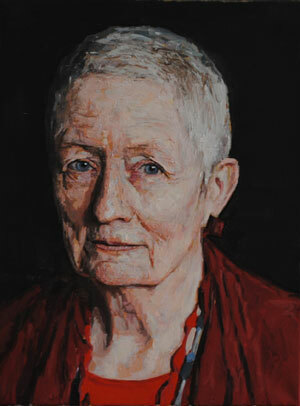 My interest in portraiture, and the concept of allo-portraits I had worked on in 2003, had already been re-awakened by a request from the Italian artist Luca del Baldo, to write a short essay on portraiture, in exchange for a portrait he painted of me, on the basis of a photograph. Del Baldo is developing a large project in this direction. In spite of the great diversity in these topics I am confident that the larger project will benefit from the smaller ones. My ongoing project is the exploration of the way art can be politically effective, not because it is “about” politics but because it imaginatively explores what the social domain of the political (as articulated by Chantal Mouffe) can offer social reality as alternative modes of being and doing. Art, that is, which contributes to turning the tables on the current vague of horror that demonstrates, as Adorno wrote, that the second world war has never been really closed. My recently completed writing project was a trilogy of three volumes on the question of political art. I seek to understand and advocate art that is political without being about politics. In each volume, one contemporary artist is central in order to examine the question in close dialogue with art of the present. All three artists are strongly committed to deploy space as their medium; one in sculpture, one in video installation, and one in abstract spatial interventions. In the first volume, I put the work of Colombian artist Doris Salcedo at the heart of the discussion. Her oeuvre is clearly and explicitly political, although never “loudly” so—never becoming propaganda for a particular cause. Although she has ample cause to make a political statement, Salcedo refrains from narrowing her work down to such statements. If her work is political, it is due to the intensity with which she creates objects in environments that changes our affective relationship to world-political issues such as violence, exclusion, and the ways in which even mourning becomes impossible. Even when a singular event, such as a political murder, inspires one of her works, Salcedo will never accept nor address the narrow interpretation of such an occurrence. This book has just appeared in Spanish. Nor can the state of permanent civil war in Colombia be construed as an excuse to provincialize her art, in an anxious attempt to confine the horror to an area that then can be left to its own devices. Paradoxically, it is the way Salcedo makes art objects out of used objects that forbids such an escapist interpretation. The used furniture she transforms and reworks into sculptures are traces, indexes of lives destroyed. The materiality of those lives creates spaces from which no one can easily withdraw. In the absence of figurative representation, it is the lines from one area of horror to another that together form a web spun around the viewing subject. This book was published in 2010. In the second volume, in contrast, figuration is central. Here, Finnish cinematographer Eija-Liisa Ahtila is the artist whose work I explore to deepen our understanding of figurative art. Nothing is easier than resorting to figurative art to depict political causes, and many have done so, sometimes to great effect. One only needs to recall Goya and his horror-impregnated Los desastres de la guerra (1810–15) to realize the possibilities. In the contemporary world, however, too many images of horror make horror invisible; too frequent depictions of it make us impermeable to empathy with the experience of horror, or other politics-driven affects. 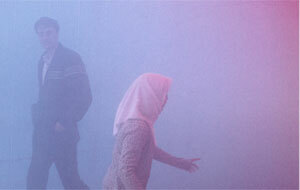 Excess “naturalizes” horror and obscures the mechanisms of that process. And as Adorno famously wrote after the Second World War, art “after” horror risks turning horror into pleasurable experience. This makes the brief of art to achieve political impact nearly impossible. I chose Ahtila, like Salcedo before her, because of the restraint with which she manages to move us deeply on a political level without ever falling into propaganda. Her oeuvre demonstrates that the political impact of art is not dependent on political statements, but, on the contrary, must stay away from the rhetoric of politics. To put it bluntly: political of art must stay aloof of politics in order to be effective. Although Ahtila’s work invariably touches us with issues that have political ramifications—such as colonialism, gender politics, and the streamlining of the imagination—even in the face of the most blatantly political issues, she will not pronounce. This volume appeared in 2013. Salcedo’s art is insistently material. Ahtila’s work is lucidly and limpidly figurative. It is why we are drawn into it, and attune to its subliminal messages, or rather, its affective impact. To avoid a one-to-one relationship between figuration and political impact I have limited the corpus for my analysis of Ahtila’s work to her video installations. This art form is not simply figurative: as soon as it consists of more than one channel, it cannot even be seen in its totality. But so much of modern and contemporary art is not figurative in the traditional sense, a sense that usually equates it with representation. Hence, it cannot even be suspected of such propagandistic endeavors as Ahtila so carefully avoids. It is my contention that art as such can be political. Whatever the forms it takes, whatever the discourse surrounding it, or within which it intervenes, art can have a social impact that answers to the political. The brief of this volume is to demonstrate the political value of that loss. I explore what makes us lose that clarity, what this loss entails, and how that helps us to live in the political, with all the tensions and contradictions that environment holds. I argue that this art proposes performing in the sense of playing (as in ludic) as its task, which in turn overdetermines its eminent suitability to stay away from propagandistic notions of political art, with its self-righteous rhetoric and empty, condescending commiseration. From the verb “acting,” then, the meaning of play must not be excised from the performativity, lest the serious impact of art become invisible. This volume also appeared in 2013. Clearly, these three books have not at all exhausted the subject. Continuing this search for effective political art I am currently exploring the work of two other artists, from the same angle. One is Polish artist Agnieszka Kalinowska. I first encountered her work when we were in Lodz for the installation of our first Madame B exhibition. I was asked to give a lecture at the Muzeum Sztuki. During my search of the museum’s holdings I found Kalinowska’s video Silencer from 2013. Watching it I realized how profoundly political a video can be without addressing anything specifically political at all. It stages estrangement, the just-not-fitting-in of young people who are out of place in the chic restaurant where they meet up. From that moment of discovery on, I have been looking more into her work, much of which addresses issues of migrations and refuge. This recent sculpture is a good example. 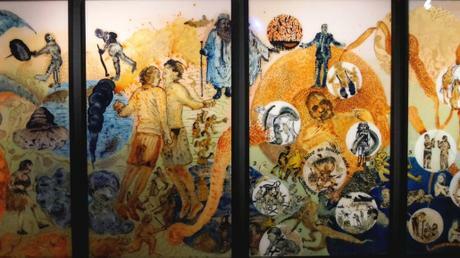 The other artist on whose work I have been writing a book is Indian artist Nalini Malani. I had encountered her shadow play work at the Centre Pompidou, in the exhibition Paris-Delhi-Bombay in 2011. 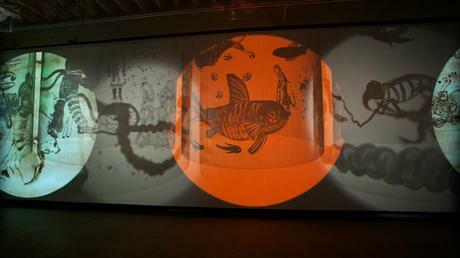 Images like shadows, projected on semi-translucent cylinders that turn, so that the shadows end up enlarged on the walls, and moving. 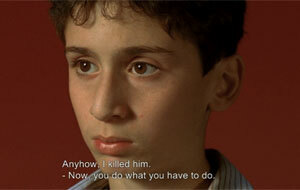 The result is an extremely powerful deployment of the idea of the (multiply) moving image - past, present and future. When I met the artist later and conveyed my enthusiasm for the shadow plays, the idea began to take shape. I told her these works needed a book, an in-depth study that no exhibition catalogue can really be. The still below is from the shadow play Remembering Mad Meg. She agreed. And then, yes, I should have been able to predict this: she asked me to write it. Then, after getting used to the idea of yet another big writing commitment, I couldn’t help growing more and more eager to do this, whatever other commitments stood in the way. Here is a still from a work that has special significance for me, Remembering Mad Meg. Its title and the inspirational painting it recalls is also the point of beginning of our project A Long History of Madness. The connection between violence and the madness that results from it, and the silence it imposes, is a deep theme Malani’s work and my own have in common. Below is an image from her 2014 exhibition in Delhi, Twice Upon a Time. I went to see it, studied the documentation of the previous two chapters of this three-partite show, talked with the artist, and was able to at least make a good start soon after the visit. The problem is that her work with its layering lends itself only meagerly for reproduction in books. In addition to my passion for the many ways images move, and moving images “theorize” those movements (according to Hubert Damisch’s concept of the “theoretical object”), Malani’s shadow play works made me delve deeper into the theoretical writings on the specter, initiated by Derrida and to which my friend Esther Peeren contributed a wonderful book, The Spectral Metaphor (2014, Palgrave Macmillan). Peeren’s book alerted me to the usefulness of the concept of spectrality as a tool to articulate the interweaving of past and present I have been so interested in ever since Quoting Caravaggio. Malani’s shadows embody that complex and vital relationship. Andreas Huyssen’s book William Kentridge & Nalini Malani: The Shadow Play as Medium of Memory that appeared in 2013 offered a great starting point as well. And then there is all the scholarship on cultural memory, to which I have contributed myself. But most importantly, Malani and I find ourselves on the same battleground against violence that specifically targets women. Malani is one of a handful of artists of a world-wide reputation who keeps that focus alive. In the current climate of violence, this is a small but significant contribution to an attempt to turn the tables - to allude to one of her shadow plays. My book on Malani’s shadow plays appeared in 2016. Tables have turned from Nalini Malani on Vimeo.